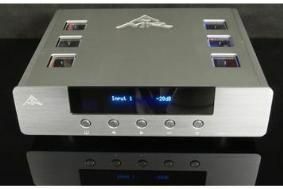 Abingdon Music Research announces 'premier class' integrated amplifier | What Hi-Fi? Described as a 'Pre-Main Amplifier', the AM-777 combines valve and solid state operation, with 'unconventional valve/bi-polar devices, a dedicated, transparent volume control and thorough power supply sections.' It also has built-in digital-to-analogue conversion, fed from a USB input. The preamp has four line inputs, one paralleled on XLR connections, a high-precision 71-step volume control and preout sockets, while the power amp combines a valve voltage-gain stage with a solid-state current gain section using bi-polar devices. The power output is 60W per channel, AMR saying this is stable whether the load being driven is 8 ohms or 4 ohms. Separate transformers are used for the valve and output stages, and the amplifier can be switched to operate as an integrated amp, separate preamp and power amp sections, or as a monobloc power amp. The AM-777 sells for €2999 excluding VAT, which should equate to around £3175 with UK tax included.